Bevel gears are technical devices that translate one direction of force into another with the power of two axles meeting. The axles usually meet at an angle of 90 degrees, although they can work at other angles. With the potential to change the direction of force and the operating angle of machinery, a bevel gear has many different applications. 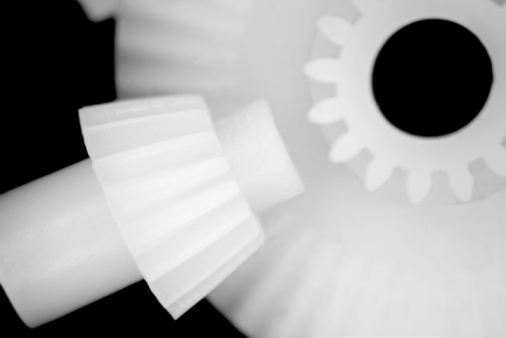 Bevel gears use different numbers of teeth to increase speed. Hand drills use a bevel gear to change the vertical rotation of the handle to the horizontal rotation of the drill. The bevel gear in a hand drill also increases the speed of the original rotation, which provides a greater output of force from human input. An electrical drill also uses smaller bevel gears in the internal mechanism, which perform a similar job. The engine of a helicopter uses bevel gears to drill on a larger scale. This type of bevel gear is designed to function at high speeds under high pressure to redirect the shaft of the engine to the vertical turn of the rotors. Cars use differential drives to provide two outputs from one input. A differential drive includes at least three bevel gears, working in perfect unison to transmit torque. Electrical garage doors use bevel gears to roll up the door, or to turn and open it. The gears are set at right angles to each other, and turn the direction of a vertical force into a horizontal force. William Thomson started writing seven years ago in 2003 and has contributed work to the student newspaper "Uyellnews" and a magazine known as "Words Yes!." William specializes in writing fiction and opinion articles. He graduated from the University of East London with a Bachelor of Arts in English literature with creative and professional writing.